Lowest Price Online: $1799.99 ? Every week keyboard nerds discuss the supposed upcoming demise of the workstation concept but you only have to look at how many workstations are currently in production to ascertain that the genre is still healthy. Great stuff all the way around until you hit a key- way too hard to get the keys down. I was unable to try one before I purchased or I would not have purchased. Great sounds though. Roland's new FA series reimagines the music workstation, streamlining it for effortless realtime power, ultra-fast workflow, and maximum versatility. Ready to support any type of music you play, the FA-08 comes with a massive sound collection inherited from the flagship INTEGRA-7, dozens of studio-quality effects, and expressive realtime controls, plus onboard sampling with zero load time for instant audio playback from the 16 backlit pads.The sequencer features simple operation and non-stop loop recording, letting you capture songs and ideas as they come and export them as multitrack data to use with your DAW. Flowing seamlessly into every part of your creative world, the FA series morphs instantly from standalone use to become the command center of your computer music studio, with USB audio/MIDI interfacing, powerful real-time controllers, DAW transport controls, and much more.No Work, All PlayMusic workstations play an important role for keyboardists in a wide range of creative activities, from live performance to song development to production in the studio. However, they can often be complicated and difficult to use to their full potential, bogging down the creative process and inhibiting the flow of ideas. 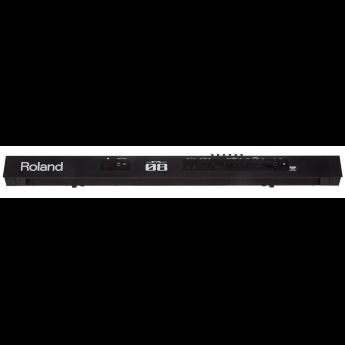 In developing the FA series, Roland has completely reimagined the music workstation to provide musicians an inspiring platform that's extremely powerful and versatile, yet simple and intuitive at the same time. With a streamlined interface and focused, practical features that maximize your creative flow, the FA series allows you to experience newfound freedom to deeply explore and develop your musical ideas with less effort than ever before.Perform and Record with a Massive Selection of Roland's Very Best SoundsThe true measure of any music workstation lies with the quality and diversity of its sounds. Filled with over 2000 tones directly inherited from the INTEGRA-7, Roland's flagship pro sound module, the FA series truly delivers in this area and then some. All of the INTEGRA-7's SuperNATURAL synth and XV-5080 PCM tones are onboard, plus an essential collection of ultra-expressive SuperNATURAL acoustic tones that includes pianos, organs, drums, bass, strings, and more. The sound engine in the FA-06/FA-08 is fully compatible with the large, growing collection of INTEGRA-7 synth tones available as free downloads from Roland's Axial sound library site, and it's also possible to expand the onboard sound set with FA-series wave sound expansion collections.Capture Ideas and Create Songs Without InterruptionSimple yet powerful, the intuitive 16-track sequencer in the FA Series has been designed to let you capture your inspiration as it happens-recording is always just a simple button press away, ensuring that you'll never lose an idea. In a flash, you can build a full arrangement with the workstation's huge array of sounds, and with continuous recording in loop mode, you're able to fill up all 16 tracks without ever stopping! In addition to real-time capture, step recording is also possible, and you have complete control to edit and mix your tracks as you go and save your song to an SDHC card as a stereo audio file. It's also possible to export your tracks as individual WAV audio files and/or MIDI data for further development in your DAW, making the FA-06/FA-08 a powerful sketchpad for capturing initial sparks that will form the basis for your full-scale computer music productions.Seamless Hardware Integration with Your DAWIn addition to standalone use as a performance instrument and composing workstation, the FA-06/FA-08 transitions into your computer-based music production world with ease. A simple press of the dedicated DAW Control button instantly sets up the workstation to communicate with your computer via USB*, letting you use the keyboard and knobs to send MIDI data to your DAW for playing software synths, controlling plug-in effects, and more. The FA series also includes control maps for popular DAWs, providing a quick and easy setup to control transport functions and more in your specific software. You can even use the FA-06/FA-08 as a USB audio interface to record a variety of different sources directly into your DAW, including a mic, guitar, or stereo line level device connected to the rear-panel input jacks, and you can capture the workstation's internal sounds and sampler playback as well. Sound output is also supported, allowing you to monitor the DAW output through the stereo output and headphones jacks on the FA-06/FA-08.Instant-Access Performance Sampler OnboardBased on Roland's mega-popular SP-404SX, the sampler in the FA series features fun, fast, hands-on operation and sampling/playback via convenient SDHC cards. You can play audio samples directly from the 16 pads on the panel, making it easy to expand your performances with loops, backing tracks, one-shots, vocal phrases, sound FX, and more. Thanks to SDHC flash memory, your samples load instantly with no wait time, and you can use the four pad banks and clipboard function to rearrange your samples as needed for any performance. It's super-easy to sample the workstation's own sounds or external sources via the Mic/Guitar and Line inputs, and you can even play WAV, AIFF, or MP3 samples that you've transferred from your computer. A variety of editing features allow you to tweak your samples to taste, including quick adjustment of playback position and level. In addition to sample triggering, the pads can be used for numerous functions such as muting parts, entering numeric values in the display, and more.Enhance Your Sounds with a Wide Range of Simultaneous EffectsWith its large selection of pro effects, the FA series provides numerous options for polishing your sounds and sequencer tracks to studio-level perfection. Independent MFX engines are available for all 16 parts of a Studio Set, giving you an enormous level of sound shaping for both live playing and song mixing. Each MFX engine contains 67 different effects types to choose from, with an additional option of a vocoder when MFX are used with Part 1. Six separate COMP+EQ processors are dedicated for individual drum sounds, while global EQ, chorus, and reverb are on tap to add a finishing touch to any of your parts as needed. With the unique TFX (total effects), you also have the ability to process the entire output of the workstation with dramatic effects such as DJ FX Looper, Isolator, and many others. All the effects can be tweaked in real time via the Sound Modify knobs, making it simple to enhance your keyboard playing, sampling, and sequencer tracks with dynamic sonic textures.Fast Workflow and Intuitive Realtime ControlYou can feel the speed of this new breed of instrument the moment you hit the power switch-unlike many workstations that can take a minute or more to boot, the FA series is ready to play in seconds. 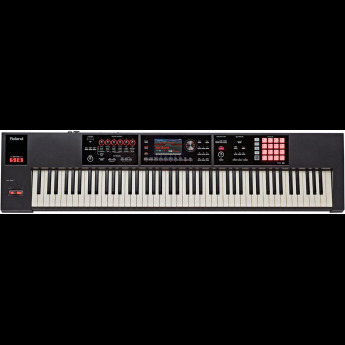 The panel is logically organized into dedicated sections, and the large color LCD presents a gorgeous look with inviting hi-res graphics for selecting tones, working with the sequencer, and adjusting various settings. It's easy to navigate through the workstation's large sound selection by category and assign favorites for fast recall, while dedicated buttons deliver instant access to often-used functions such as transpose, octave range, and many others. With six knobs and a powerful yet easy-to-use assignment matrix, the Sound Modify section lets you control a wide range of parameters in real time for maximum expression while performing live and working in the studio.